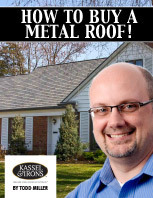 Kassel & Irons manufactures environmentally conscious steel roofing that is stunningly beautiful and designed for the utmost in protection and durability for your home. With an outstanding warranty and unmatched performance, our interlocking steel roof panels with concealed fasteners stand up to extreme temperatures and harsh weather. Our products are manufactured with a high content of recycled materials, providing summer energy savings, and reduced construction waste. That adds up to positive environmental benefits from just one good roofing decision. Highly engineered for strength, and finished with nuanced, long-lasting colors for beauty, Kassel & Irons invites you to learn more about the steel shingles that can deliver the roof of a lifetime.